The Caché Object Gateway for .NET (which this book will usually refer to as simply the .NET Gateway) provides an easy way for Caché to interoperate with Microsoft .NET Framework components. The .NET Gateway can instantiate an external .NET object and manipulate it as if it were a native object within Caché. The .NET Gateway can also be used in an Ensemble production (see the Ensemble document Using the Object Gateway for .NET). You can create and test your .NET Gateway classes in Caché, as described in this book, and then add them to a production using the Ensemble .NET Gateway business service. The external .NET object is represented within Caché by a proxy class. A proxy object looks and behaves just like any other Caché object, but it has the capability to issue method calls out to the .NET Common Language Runtime (CLR), either locally or remotely over a TCP/IP connection. Any method call on the Caché proxy object triggers the corresponding method of a .NET object inside the CLR. 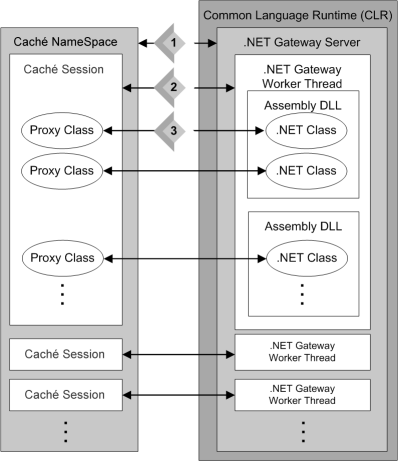 The following diagram offers a conceptual view of Caché and the .NET Gateway at runtime. A Caché namespace accesses an instance of the .NET Gateway Server. Access is controlled by an instance of the Caché %Net.Remote.Service class. Each Caché session is connected to a separate thread within the Gateway server. The connection is controlled by an instance of the Caché %Net.Remote.Gateway class. Caché sends a message over the TCP/IP connection to the .NET Gateway worker thread. The message consists of the method name, parameters, and occasionally some other information. The .NET Gateway worker thread finds the appropriate method or constructor call and invokes it using .NET reflection. The results of the method invocation (if any) are sent back to the Caché proxy object over the same TCP/IP channel, and the proxy method returns the results to the Caché application. You can access a proxy class with code written in either Caché Basic or ObjectScript. The examples in this document use ObjectScript. In most cases, you will use the .NET Gateway by creating proxy classes for your custom .NET components (see the chapter on Creating Proxy Classes for details). However, it is also possible to create proxy mappings for an entire third party .NET application interface specification. Ability to use legacy DLLs  ActiveX DLLs cannot be used directly in a 64bit Windows environment, and a DLL that was not written as a .NET assembly cannot be used with the .NET Gateway even in a 32bit environment. However, it is possible to create a wrapper that the .NET Gateway can use to call a DLL indirectly. Before you can use the .NET Gateway, you must start an instance of the .NET Gateway Server and tell Caché the name of the host on which the server is running. Once started, a server runs until it is explicitly shut down. Upon receiving the request, the .NET Gateway server starts a worker thread in which the .NET class methods subsequently run. The connection between this .NET Gateway worker thread and the corresponding Caché session remains established until it is explicitly disconnected. As long as it remains connected, the assigned port for the connection stays in use and is unavailable for use in other connections. See Setting Gateway Server Properties for a detailed description of how to create a .NET Gateway Server property definition, and Running a Gateway Server for details on how to start, connect, disconnect, and stop a server. The Caché session sends an import request. 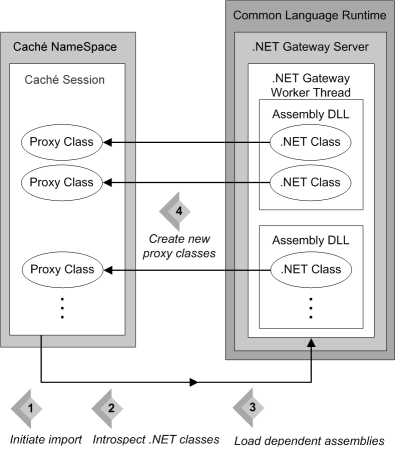 Upon receiving the request, the .NET Gateway worker thread introspects the indicated .NET assemblies and classes. If it finds any .NET classes that are new or changed, or that have no proxy classes on the Caché side, the .NET Gateway worker thread returns the results of the introspection to the Caché session, which uses the information to generate new proxy classes. %Net.Remote.ObjectGateway  an ObjectGateway object contains the property settings required to run and monitor an instance of the .NET Gateway Server. See Defining a Gateway Server for a detailed description. %Net.Remote.Service  a Service object controls the interface between a Caché namespace and an instance of the .NET Gateway Server. See Running a Gateway Server. 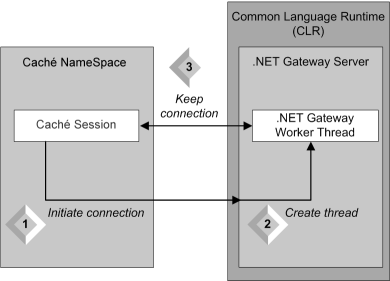 %Net.Remote.Gateway  a Gateway object controls the connection between a Caché session and a worker thread within an instance of the .NET Gateway Server, and provides methods to generate proxy classes. See Connecting to a Server and Generating Proxy Classes Programmatically. %Net.Remote.ImportHelper  the ImportHelper class provides some extra class methods for inspecting assemblies and generating proxy classes. See Generating Caché Proxy Classes. See the Caché class library documentation for the most complete and up to date information on each of these classes.